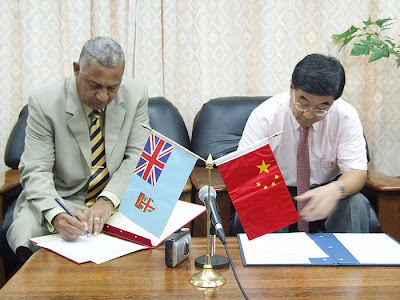 Fiji-China's South Pacific "Client State"
In February 2007 I judged it likely at that China would be the major beneficiary of Commodore Bainimarama's Fijian coup d'etat. Now Beijing is using chequebook diplomacy to turn Fiji into China's newest "client state"
In February China donated $200,000 to Fiji to assist in rural recovery efforts after Cyclone Gene caused severe damage across the country. Prime Minister Commodore Voreqe Bainimarama and His Excellency Cai Jinbiao, Ambassador of the Peoples Republic of China signing documents re China's donation. That donation was chicken feed, compared to recent announcements. The new Nadarivatu hydro power project to cost roughly $230 million will save about $44 million per year in fuel costs for the Fiji Electricity Authority. Speaking at the signing between FEA and Sinohydro Corporation of China today interim Prime Minister Commodore Voreqe Bainimarama said it is a significant achievement for Fiji. “We should all be proud that Fiji is making an earnest effort towards making contributions in curbing global warming in alignment with the Kyoto Protocol,” he said. Commodore Bainimarama said Fiji has much to gain as the construction of the hydro dam will bring with it employment opportunities and financial benefits to landowners. “The capital investment of F$230 million on this project will eventually equate to considerable financial savings on the costs of generating electricity by diesel fuel.," he said. At its scheduled completion in 2011, the project would be a major step towards achieving FEA’s renewable energy strategy. And this is to provide 90 per cent of Fiji’s power demands by clean and renewable energy. The new hydro scheme is expected to consist of a small dam. The structure will stand 40m high above its foundations and 32 km above the present water level. When completed, it will have a power capacity of 41.7MW with an annual generation of 101 million units. Sinohydro Corporation is a renowned hydro construction company in China. Where will Fiji get the money from to pay Sinohydro? The People’s Republic of China will be providing $240m to Fiji for rural development, a key area the interim Government will target next year. China will also assist the interim Government with funds and expertise to build low-cost housing projects. Interim Prime Minister Commodore Voreqe Bainimarama reaffirmed these commitments by China to Fiji’s development while visiting rural areas over the past week. On Wednesday, Bainimarama told people of Nubuyanitu in the Viti Levu highlands that they would be included in the development plans for 2009 which would focus on the rural areas. Commodore Bainimarama confirmed that an approval has been made for road development in the areas of Navosa. “The development in the rural areas will be the top priority of this Government. Development will not be concentrated only in Viti Levu but would be Fiji wide,” he said. This should concern all concerned with preserving freedom in our region. Unless Chinese expansion in our region is vigorously opposed, we will see a steady erosion of liberty in the South Pacific and a mssive increase in political corruption. Who Will be China's Stalin?